Beam Oak Flooring is comprised of oak boards that are sawn from beams that were harvested from the forest 100-200 years ago producing a unique color and quality that is just not available today. Most of the traditional characteristics found in a classic oak floor are found within the reclaimed beam sawn oak floor, but with a superior wood fiber. This slow grown material has a unique rich color when finished that is simply not able to be replicated. Completing this floor with an oil-based finish is recommended. This will bring out the natural colors and tannins in the wood. It can also be easily stained prior to finish as well. 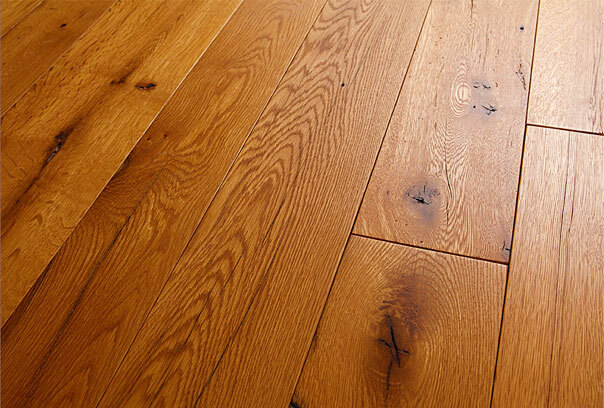 Beam Oak Flooring originates from the oak beams found throughout the barn structures that are deconstructed. These oak beams have many shapes, sizes and textures, but once sawn, they are yielding prized oak boards that have much to offer. These beams were cut from trees that grew in the time of prized timberland. These trees grew in dense forest where there was competition for light, water and nutrients which resulted in very slow growth. The slow growth oak trees are now yielding some of the finest oak boards, far different from any material harvested today. It is safe to say, “it is made like it used to be”.